” Ways Website Visitors Are Helping Animals Adverts contribute towards site running costs, but currently may not fit with the site ethos. We will continue to work on a solution. 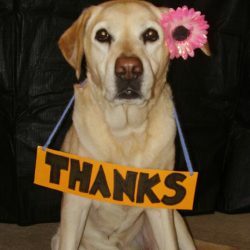 We love to learn of how our website visitors use their time, skills, talents and abilities to help raise funds for animals in desperate need, to raise awareness of their plight, or just help animals in general. If you feel inspired by these compassionate people, you can see many ideas of different ways you may be able to help too, in the How To Stop Animal Cruelty & Suffering section. Below are just a few examples of what our website visitors are doing to help animals. Upset by the images of animal abuse she saw, and cruelty she heard about, website visitor DJ Lickerish, felt that she wanted to do something to help stop it. The animal loving DJ performs sets in the Hollywood and Los Angeles area of California and has chosen to use her skills to hold fund raising events. They are at well known North Hollywood club, Club Cobra, in the LGBT community. All the proceeds go to help stop world wide animal cruelty and suffering. Many people just shake their heads and say how terrible the cruelty is, which does nothing to help. But DJ Lickerish, AKA Jessica Cortes, decided to actively make a difference. Image: Big hearted website visitor DJ Lickerish uses her skills to run events in the Cobra Club, North Hollywood, to raise funds to help stop animal cruelty and suffering worldwide. 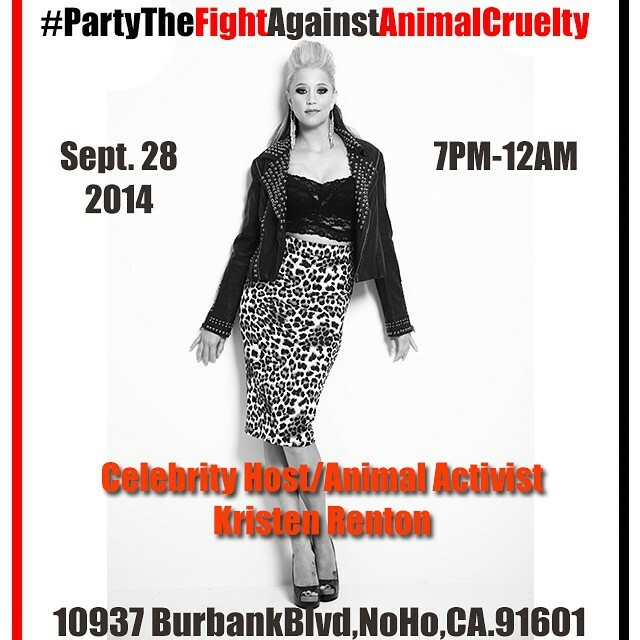 In the event shown in the flyer above, actress and animal activist Kirsten Renton, will be the celebrity host. The actress is known for starring in, among other things, Days Of Our Lives, Sons Of Anarchy, Strictly Sexual: The Series, and MTV’s Now What? The more people who attend these events, the more money is raised to save more innocent animals from suffering, and you can help by attending, sharing and publicising these events on social networking sites, and any other places you can. Image: DJ Lickerish runs fantastic fundraising events in the Hollywood area, such as the event below, to raise funds to help stop animal cruelty and suffering worldwide. A website visitor called Diane saw the Knitting & Sewing For Charity page on which it mentions, that in some Eastern European countries, the rescues are extremely poor and the winters get extremely cold. This results in many dogs dying or falling gravely ill. Veterinary care is very basic in many of these places and the rescues have hardly any public support in their own country. This is due to most citizens seeing the street dogs as vermin and are known to attack, torture and kill them. Diane, from the UK, contacted us and volunteered to make the dogs warm, waterproof coats. They turned out to be of wonderful quality and will surely have saved innocent dogs lives. She made them so quickly too, so as many rescues as possible got them in time for the cold winter. She is such a dedicated and compassionate lady! The coats went to an organisation called Marianne’s Food Bank, a group that collects supplies for rescues and shares them among them. Both Marianne’s Food Bank and the rescues were thrilled with her coats, and very thankful for them. 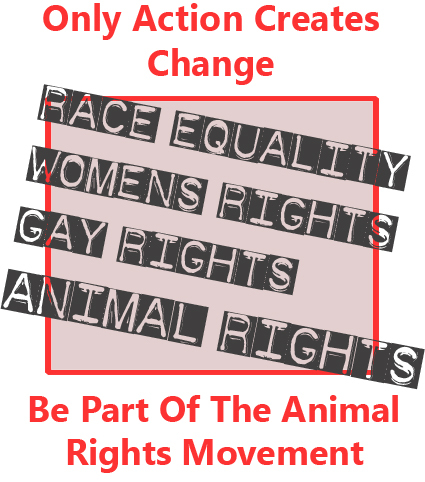 Many of our website visitors are young people, passionately against cruel treatment of animals. Considering young people are the future of the world, it is heart warming to know of their compassion. They give me hope that things really will change as more people are made aware of the animal suffering that goes on, and fight against it. 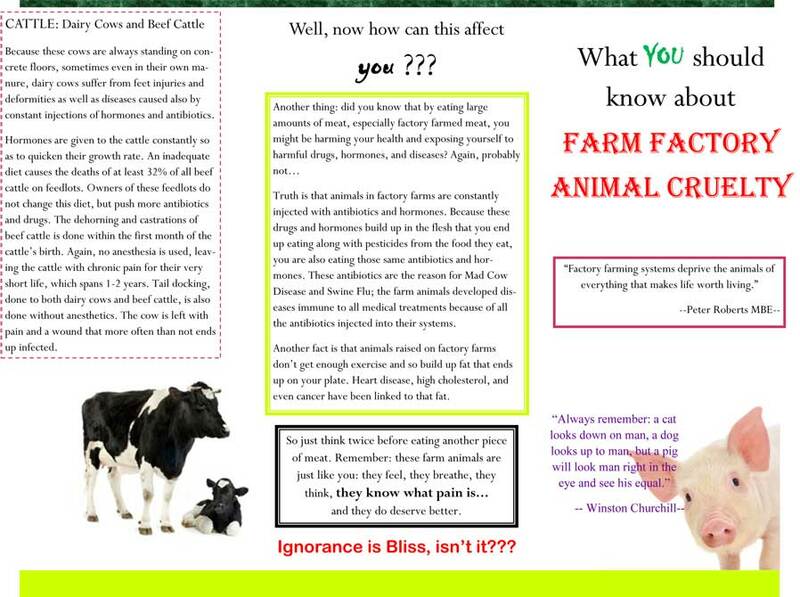 Some of these young people choose to do school projects about animal cruelty, using information from the website. By doing projects they can share with their classmates, such as presentations, posters, leaflets or displays, they can raise awareness of animal cruelty and suffering among a large number of people who may well not otherwise have learned about it. 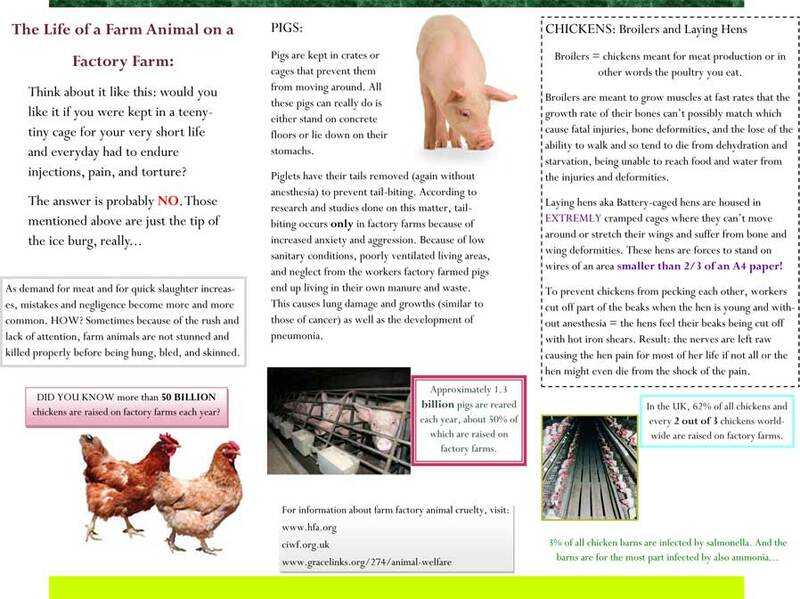 Image This fantastic tri-folding leaflet full of facts about factory farming, was created by Michal Abraham for a project at school in Istanbul, Turkey. This talented student wanted to educate his school community about the cruelty involved. You can see both sides of his tri-folding leaflet below. 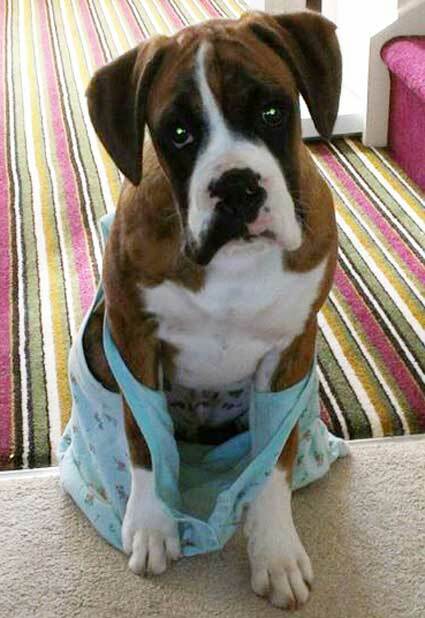 Website Visitor Marianne Hellon, from Cumbria in the UK, panicked when her fun loving and adventurous Boxer Dog Puppy, Parker, escaped from her garden. As Marianne and her family frantically searched for Parker, they got news they had dreaded, that a dog had been killed nearby by a car. Still holding on to the desperate hope that the dog involved in the accident was not their beloved Parker, sadly their worst fears were confirmed. To add to this terrible trauma, they found that after hitting him, the callous driver had just left poor Parker on the road. Marianne was, as you can imagine, completely devastated by this traumatic event, and felt she would never be able to feel happy again. As she battled to heal her broken heart, she recalled that she had recently learned that there were dog rescues that specialised in specific breeds (see the Adopt A Pet page). She found a Boxer Dog Rescue called Joey’s Legacy Boxer Rescue Liverpool, and felt that the best way to honour Parker’s memory was to help his fellow dogs that were in need, so Parker could have a lasting legacy. This resulted in her adopting a senior Boxer Dog, called Jade. The happiness Marianne brought to Jade by giving her a loving home, gave Marianne a reason to feel happy again. The birth of Marianne’s baby son soon after, who Jade adores, added to the family’s happiness. 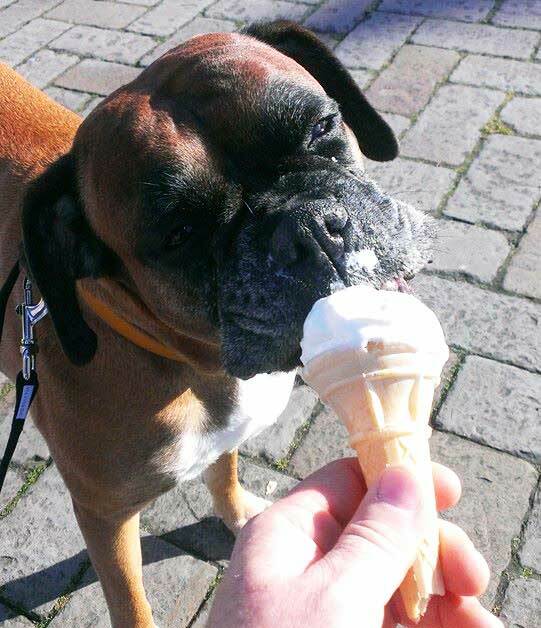 Image: Marianne’s happy adopted Boxer dog Jade enjoying a lick of ice cream. 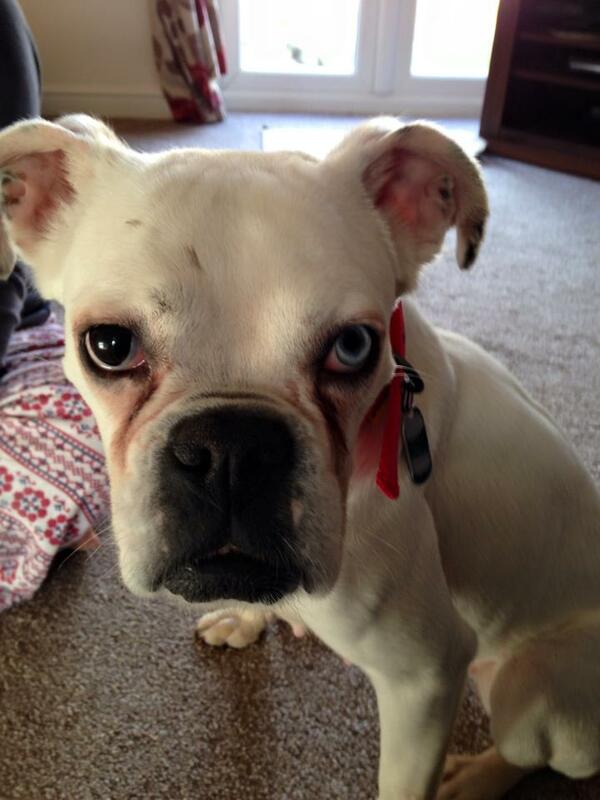 “Jade was already house trained, calm and well behaved. Because her personality is already fully formed, we know that she will always be that lovely dog. She is very low maintenance and doesn’t need long walks. She also sleeps a lot due to her age, which is great if you have kids, as then you don’t feel guilty about not being able to constantly keep them all entertained. It is less exhausting too! Jade is just grateful when she is shown any kind of affection, and is so happy and content with the smallest things, like having her tummy tickled! Plus she gives you twice as much love back !! Image: Marianne agrees with the sentiments of the image below. She says “Knowing I have made such a difference to Jade’s life gives me a really warm feeling and has made me feel like a nicer person. It’s one of the things I am most proud of myself for and is so rewarding”. By adopting an abandoned dog who needed a loving home, Marianne created a rescue space at the rescue, meaning the rescue could save another innocent abandoned Boxer Dog from being put to death. (For more information, see the Pet Abandonment page of this site). Adopting Jade is not the only way Marianne has helped animals in need since the tragic event of losing Parker. As she learned more about the plight of so many animals in need, she used her Facebook page more and more to spread the word of dogs in need of homes or rescue spaces, and of lost dogs. In addition, she regularly has a clear out of items she feels she can do without, and donates them to auctions and sales run in aid of helping to stop animal suffering. Many of these auctions and sales can be found here. She also donates items to animal charity shops. After making sure Jade spent the remainder of her life feeling loved and secure in their home, Marianne and her family have gone on to adopt another Boxer dog from Northern Roae Boxer Rescue. the dog, Casey, is another lucky dog to get such a loving home. Image: Casey, another dog Marianne and her family adopted from an animal rescue. One thing is for sure, little Parker has a lot to be proud of his Mum for. Many of us have problems in our homes with invasions of insects, mice, ans other unwanted visitors. A friend of mine had an ant problem and wanted to get rid of them, but avoid causing suffering to them. Many people kill animals they consider to be pests, but probably do not realise the pain and suffering caused to them by doing that. Imagine giant aliens coming to earth and thinking that we are so small and unintelligent compared to them, crushing us, pouring boiling water on us or spraying us with lethal chemicals won’t cause us pain and distress. We should be intelligent enough to realise that we cannot assume that they do not feel pain, fear, and distress. In fact many scientific studies have concluded that they do. Another problem with killing them is that if you use chemicals to do so, they are harmful to you and your pets as well as the “pest”. In addition, killing them usually does not prevent more coming. These “pests” are just going about their business, trying to survive, and do not know they are annoying people. A humane, chemical free and cruelty free way of repelling them to prevent the problem occurring in the first place is the perfect solution for all involved. I mentioned to my friend that we ourselves had problems year after year with ants invading our kitchen. I told her of all advice we followed about keeping the kitchen free of crumbs and spillages, putting talc/baby powder around the edges of the room, and tried spraying essential lavender oil or peppermint oil, diluted with water, all around the room and the areas they entered (but not directly on them). We even put trails of food for them leading away from the house and tried various other methods. The talc was an immediate failure, as they just walked through it, and the peppermint oil made my eyes sting and water every time I went into the kitchen. Other methods seemed to have little or no effect. We continued to use the lavender oil and food trails going away from the house, and those seemed to help…at least it did for one year. The next year the ants were back and those measures did not deter them. We were back to gently scooping them all up and putting them out the window. This took A LOT of time! That’s what had made me decide to look into the plug in pest repellers I had heard about. 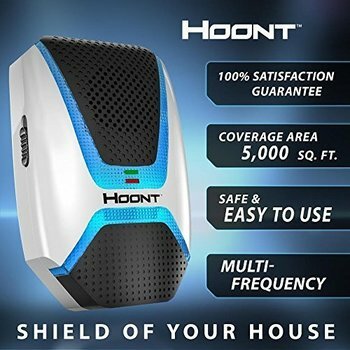 I looked on Amazon because I wanted to read all the reviews given about different brands and products. I was very unsure about investing in one, because the reviews could vary so much from one person to another. I did a lot of research and learned that the best ones had both ultrasonic and electromagnetic technology, and would vary their patterns so that the unwanted visitors did not get used it. I was made even more unsure about buying one when I read that there is no conclusive scientific proof that these gadgets work. When I finally decided on which one to buy, I was half thinking I was wasting my money. However, it turned out to be one of the best things I ever bought! Within DAYS the majority of the ants had gone! For a period of time, the odd one would wander in now and again, but since then, absolutely nothing. We now haven’t seen a single ant in the kitchen for a couple of years, and it is now ant season again. We still see lots of them outside the house, but they don’t come in anymore. I want more people to know about these brilliant insect repellers so that it can be a happy, cruelty free ending for the ants, or other pets, and for the people. This is the one I bought, which I searched to find the best price for. My friend took my advice and bought the same one, and is delighted with the results as well. To see what I myself do that is suggested in the How To Stop Animal Cruelty & Suffering section of this website, please see the About Me page. If you would like to see many ideas of different ways you may be able to help, have a look at the How To Stop Animal Cruelty & Suffering section. There are so many varying suggestions, that there is bound to be something that suits every persons circumstances.